When growers consider a new piece of high-tech equipment, fuel storage tanks may not be the first thing that comes to mind. But modern fuel storage and delivery is more efficient, environmentally friendly and, most of all, a lot safer. While there are regulations around fuel storage and delivery, it can sometimes seem more of a hassle than a benefit to change out fuel tanks. Some provinces, like Manitoba, have strict environmental regulations on new systems, which can sometimes deter growers. Other provinces, like Alberta, have programs in place that help defray some of the costs of a new system as long as it meets environmental farm plan guidelines. Brewin says that most growers who choose to upgrade their fuel storage system are being proactive, as full containment will likely be the norm in the near future. But he says there are still many older, gravityfed systems on prairie farms. 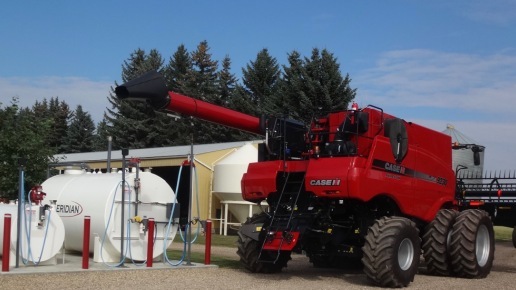 Currently, most growers choose to upgrade their fuel storage because of the size of their farm, and the increased capacity of modern farm equipment. For farms in the 2,000- to 5,000-acre range, a 15,000- to 25,000-litre tank will usually suffice. If your farm is in the 5,000-plus acre range, a 50,000- to 75,000-litre tank will speed up efficiency and allow you to take advantage of bulk delivery pricing. Also, electronic pumps will allow for a 40 gallon per minute pump rate, which is significantly faster than gravity-fed systems.